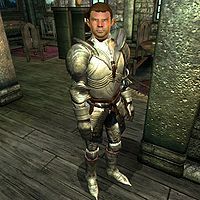 Vincent Galien is a Breton drillmaster and an apprentice of the Fighters Guild chapter in Bravil. As the lowest ranking member in the guildhall, Vincent hasn’t been given too many responsibilities and therefore drifts around for most of the day. He sleeps on the 2nd floor every night between midnight and 6am and spends the first four hours of the day wandering around the ground floor. At 10am, it’s time for a lengthy sparring session against Tadrose Helas. They keep going until 4pm, when he proceeds to wander around until dinnertime. At 6pm, he finds a seat at the table and takes his dinner with his fellow guildmembers. At 8pm, he gets up, and spends the rest of the evening strolling lazily around until he heads back up on the 2nd floor and finds his bed at midnight. He wields a steel longsword and wears steel boots, cuirass, greaves and gauntlets, all of which he will un-equip during the night. He carries nothing except a small amount of gold.